The chukar is, indeed, the West's most elusive game bird and until now good, solid information on how to hunt them – in book form at least – has been even more elusive. Now, however, an authoritative and detailed guide about hunting chukar has been written by Oregon hunter Richard O'Toole, who has pursued this wily bird since 1963. O'Toole brings a wealth of experience and love for the chukar to his book, which has truly been a labor of love. 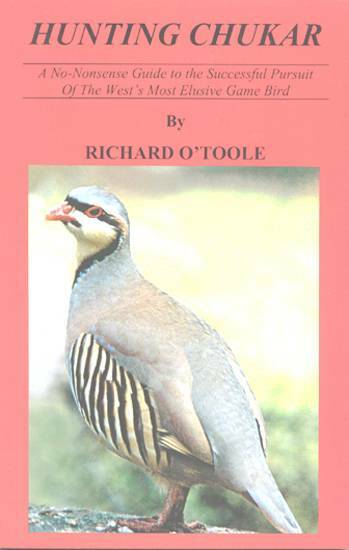 Chapters include a history of chukar and its habitat, the chukar diet, chukar reproduction, what you'll experience in the field, locating birds, tactics to use in hunting them, a chapter about dogs, hunting gear, the preparation and preservation of the birds along with a few choice recipes, plus interviews with experienced chukar hunters. Many photographs illustrate this attractive book. 6x9 format, 12 chapters and an appendix.